Do you have a sauce, chutney and spreads graveyard amassing in your fridge? 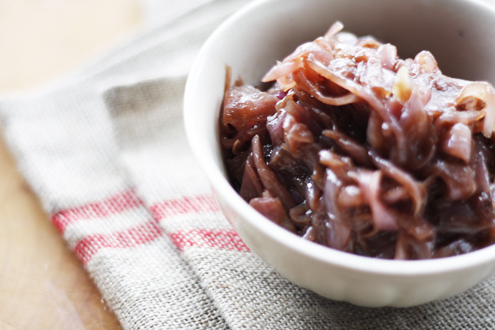 Well you’ll be happy to discover this gestational diabetes friendly caramelised onion which won’t loiter for long. It’s the perfect addition to sandwiches, salads, pastas or pizzas and I’d suggest making a double batch. I think you’re going to like it. When onions are soft add balsamic vinegar and stir well. Cook on low for a further 5 -10 minutes until sticky and caramelised. Either use straight away or cool and store in an airtight container for up to 3 weeks in the fridge. Post-GDM tip: Add a tablespoon of soft brown sugar at the same time as the vinegar to really help the caramelisation and bring out the sweetness. I have recently been diagnosed with GDM & was given your website. Love the recipe selection. I have been busy going through them & writing my shopping list. I was wondering why ‘tinned tomatoes’ fall into the carbohydrate list? Thanks for the wonderfully informative website.